When you commit to the Whole30 diet, you’re promising your body a well-deserved detox from any foods that might be causing you more harm than good. But pulling off 30 days of clean eating doesn’t just happen. When you cut out sugar, dairy, grains, and legumes, you’ll need to do a little extra meal planning to make sure you stick it out (and aren’t stuck eating scrambled eggs for every meal!). Taco meat is a great Whole30-friendly protein that you can make in no time. You can easily brown ground chicken or beef stovetop in just under ten minutes. Season with a little cumin, garlic, and chili powder. Pack for lunch along with whole pieces of romaine that can be used in place of taco shells. For a little extra flavor, don’t forget the salsa or guacamole, both Whole30-compliant! Whole30 doesn’t mean you have to give up sandwiches. Simply ditch the bread and enjoy all the remaining goodness of a BLT sandwich. Slice the tomatoes while you fry up some bacon, then use the lettuce to hold it all together. 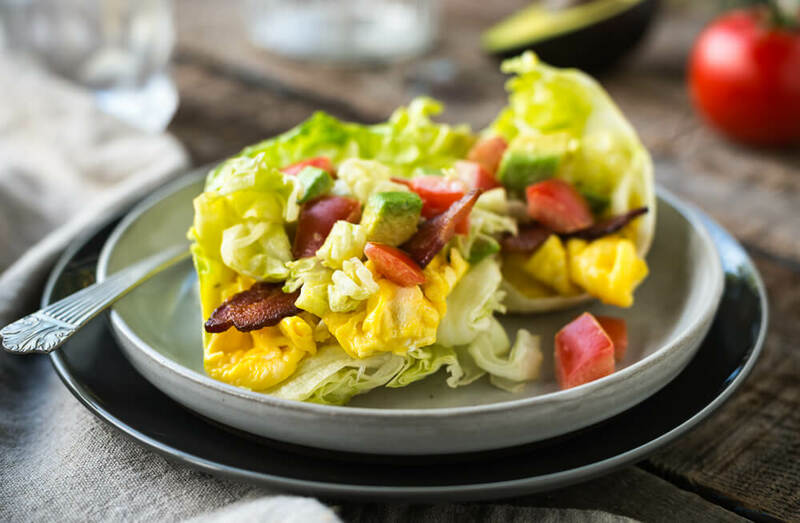 Since avocado makes everything better, add a few slices to jazz up this BLT. If you have a spiralizer, this zucchini noodle dish can be a great substitute for when you’re craving pasta salad. Whisk together a vinaigrette of lemon juice, mustard, garlic, and olive oil. Toss your prepared “zoodles” in this dressing, adding sliced radishes if you like. Top with your favorite protein (like pre-cooked shrimp, tuna, or chicken) and enjoy cold, seasoning with salt and pepper to taste. This approach to tuna salad is so delicious that you won’t even miss the mayo. Slice an avocado in half and scoop out most of the flesh, leaving about 1/4-inch thickness on each half shell. Combine the avocado with a can of tuna and a little bit of lemon juice, season the mixture with salt and pepper, and scoop into the avocado halves. With a few small modifications, a Cobb salad makes an excellent quick and easy Whole30 lunch. Get a big tupperware dish and fill it 3/4 of the way up with your favorite salad greens. Layer on a sliced hard-boiled egg, cooked chicken cubes, and diced avocado, tomato, and cucumber. Substitute a simple vinaigrette for a creamy dressing and you’re good to go (or make your own Whole30-friendly ranch by substituting coconut milk for mayo!). To make this crunchy chicken salad, mix together chopped cabbage, shredded carrots, thinly-sliced red pepper, slivered almonds, and cooked shredded chicken. For the dressing, combine equal parts olive oil and rice vinegar with a touch of sesame oil. Shake and drizzle over salad right before eating. For more gluten-free, dairy-free recipes, give PlateJoy’s recipe planning tools a try or check out more of our Whole30 blogs!